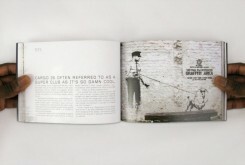 If you’re a fan of Banksy … here is a book for you. ‘Exit Through the Gift Shop’ is fun to watch. I saw it in a cinema in Cleveland, Ohio and was the only person younger than 60 years old in the room. I can testify to the repeated laughter of several sets of grandparents. Banksy made the story and narrative appealing to everybody, and we can certainly agree that this ability is part of what made his street art so popular in the first place. The film, like his other visual work is easy and accessible. It has one quick punch. More impressive however, is his ability to use this punch to open people up and get them thinking, talking or laughing (even at themselves). It’s an entertaining movie, but if you’re interested in Banksy I can suggest a good alternative that may not appeal to your grandma, but is surely of interest to long time Banksy fans, forum fanatics or anybody trying to understand what all the fuss is about. Martin Bull’s Banksy Locations (and a tour) Vol. 2 provides an unpretentious yet critical look at Banksy’s public works. It would be possible to claim that a great deal of the interest in the Oscar nominated film is indebted to the content you’ll find in Bull’s book. It is an honest little gem that properly belongs in the gift shop, but could one day enter the shelves as an historical reference that documents the work that led to the rise of the Banksy brand. Unlike many contemporary looks at Banksy, Bull does not talk about money or marketing or make half assed belly flops into philosophy, but rather returns to the scene of the crime that has the whole culture industry sniffing around in the first place; traces of illegal art. This is a book about the grimy work, not the smoke and mirrors that keep the wizard behind the curtain. Piece by piece, Martin Bull takes us around England using photographs of Banksy works. He describes each piece by extrapolating its context and trying to verify facts: When was it done? With whom? Is it part of a series? Is it referenced in other works? Did it spark public debate? How can you get there to see it yourself? Obviously, this is the one that the book seems to answer to. With regard to Banksy, this is the gift the author makes- the gesture exchanged for gestures. Of course there will be those who cry out and reference all the people trying to make money on Banksy’s back, but having read the book, this does not come off like that for even a single second. On the contrary, Bull shows his respect for the sense of gift economy that fueled street art by donating a generous percentage of sales to charitable foundations (more than 27,500 GBP to date!). The follow up to his 2006 self published “Banksy Locations and Tours,” which focused on three distinct areas in London, this ambitious sequel continues the hard work of locating Banksy works and providing a refreshing response to them that will resonate with anybody touched by the mysteries of art on the street before there were 100 films and 1000 books trying to demystify it. Including 135 detailed locations of Banksy’s street graffiti past and present, with 220 color photographs on 380 pages, the work is more of a layman’s doctoral dissertation than it is a marketing mechanism for some other objective. It is also very user friendly. It speaks like one might talk to a friend in the pub and provides additional sources of information on every issue it touches. If you are interested in Street Art or Graffiti, the market is saturated with publications; A-Z’s that make claims, champion myths as truths and come out pre-maturely enough to ensure there will be no sweaty climax, but my personal opinion is that this bit of research from Bull will provide you more bang for your buck. It might also become the map of a lovely adventure; street art as an excuse to explore the streets and challenge your perceptions or simply enjoy a nice day out looking at art without visiting a museum or gallery. You can find Bull’s latest book at Foyles, Waterstone’s, Play, Amazon, the Tate Modern, and various other galleries and selected indie and urban culture shops across the UK, or online at his website.